I've got a 6 1/2 foot full sized truck bed and an old 14ft aluminium boat. I've read online where people transport aluminium boats with pickup trucks and tie downs/straps where the boat hangs out the back. Seems like every time, they do this with the tailgate down. Challenge for me in that I will have an 18 foot boat on a trailer. Would it be possible to have the tailgate UP with the 14 ft aluminium boat in the truck bed AND the 18 ft boat on the trailer? Oh, I know, the image is terrible ... Hmmm?! 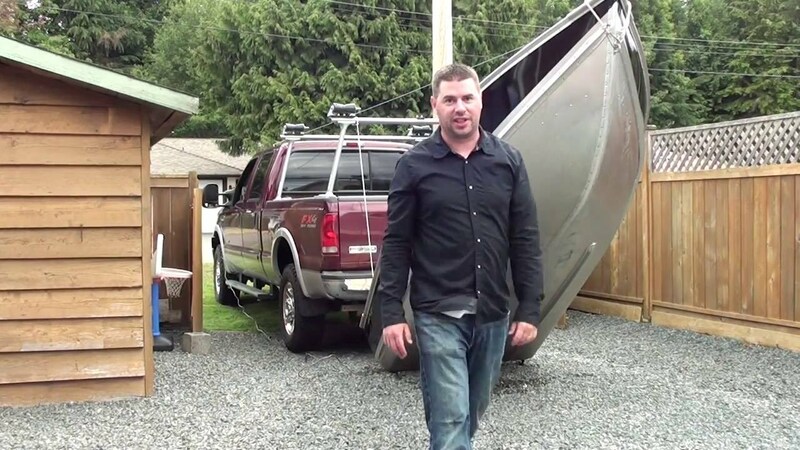 many people haul aluminum john boats in the back of pickemups all the time. The ladder rack seems like the best idea. And you can always get other usage out of that rack. There are many add-on accessories for pickups such as racks for many purposes. You say you are also trailering an 18 foot boat. What type of boat is this? Can you strap the 14 footer on top of the 18 footer? Been there, done that. Put her in stern first, drop a couple cement blocks in the stern, tie her down real good and you should be good to go. Now, I'm assuming you are moving the boat from one place to another. If this is a weekly routine thing to get to the water, forget it...!!! The roof rack is even a worse idea, unless you have 6 guys to help you load and unload. Been there, done that as well. If you need 2 boats at the water, use 2 cars and 2 trailers. Been there and done that too and it worked very well. You didn't watch the video did you? One man job. There's SO much wrong with that guy's contraption in that video. It's dangerous. A recipe for disaster. He said it weighs 205 pounds. If something fails, it can fall on someone or damage his truck or other property. How does he drop it in the water? His truck needs to be partially in the water. He has to be in the water. The same with retrieval. It takes too long. Everyone at the ramp is going have to wait for him to winch that thing. He won't have any of his fishing gear, life jackets, oars, fish finder, anchor, lines, cooler, gas, motor etc. pre-loaded into the boat. So that will also take time. There's nothing worse than waiting at the ramp for someone to load gear into their boat. Hey You-Tube dude! Just buy a trailer! I have two boats. 18' bow rider and a 15' Jon boat and each have their own trailer. Just pick a boat, hitch it up and go. Launch/retrieval is a couple minutes for either boat. And safe! Last edited by poconojoe; January 24th, 2019, 07:01 PM. Yeah, I agree. His life is not easier, just the opposite. At best, his design is in the Alpha stage and needs some improvement, like guides to keep the boat on the rollers. It reminds me a bit of my contraption to step and un-step my small sailboat's mast single handed. It took several revisions to get it right. I built a rack to do just this. I’ll see if i can find pictures. It was really simple and very safe. poconojoe I literally see dozens of those setups each year up in the great white north.Most are manual powered but same basic setup.Now mind you people are going into remote lakes not busy ramps .Id prefer a wireless remote for added safety though. Yes I did. See post #9. There's an old guy that takes his little tinny to the same ramp that I use. He puts it on the "roof" too. Watching him load and unload gives me a headache. I have offered to help several times and he gets huffy because he says he built the contraption so he wouldn't have to ask for help. When I causally suggested he get a trailer he said he already had one. His excuse was he wouldn't pay the $30 for an annual trailer parking sticker. Now I just smile and say hello when I see him. Now that's a hem frugal! See post #12. Especially note the part about remote lakes. "Most" people doing this aren't at a public ramp with help available. They're alone in the boonies. Perhaps on unimproved roads where they wouldn't even want to bang along a trailer. It's a perfectly viable solution in many cases. And your offer to help him? What if you injure yourself helping and then decide to sue him? Some people like to be self-sufficient. I applaud the ingenuity. The OP didn't really get specific about his needs so we're all just throwing ideas out that fit the general gist of his question.